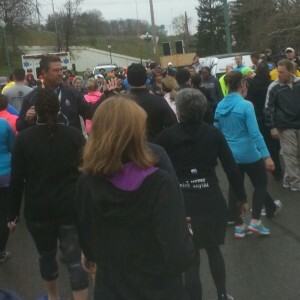 Keeping you warm AND entertained on your run. Isotoner Signature Active SmarTouch Gloves are gloves with special lining designed to allow the wearer to use touchscreen devices like smartphones and tablets. The gloves I tested out are comprised of a combination of cloth and nylon for the exterior and interior. On the upper part of the hand (where the palm connects to the fingers), there is smooth leather padding. The padding also runs up the pointer finger, middle finger, and thumb. 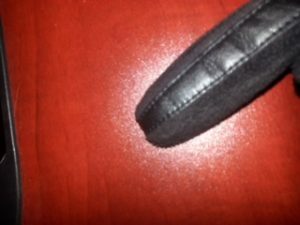 This leather makes what I’ll call the glove’s touch strips and are how one uses your devices. The glove’s end breaks at about where a watch would be worn on the wrist. Winter is an unfortunate fact of life for many Casual Runners: the cold temperature, gusty winds, precipitation, and slippery roads make winter the worst season in my opinion. Unless you are able to get to warmer climates—Disney perhaps?—dealing with these elements is an inevitable part of keeping active throughout the year, meaning a good pair of gloves are a necessity. At the same time, there many pieces of tech that makes running more enjoyable: Ipods, iPhones, or other devices can be used to play your favorite beat while out running; your phone or pedometer will record how far you ran…but all of these may need adjustment throughout your run. When you are wearing gloves, however, that can be difficult, even if you are wearing thinner gloves that allow for more precise manipulation. Well, the SmarTouch Gloves are designed to let you keep your hands warm and still allow you to work your phone or music. The gloves are not bulky to allow for precise pointing, clicking, scrolling, etc. And the padding of the gloves allows the runner to swipe screens and other touchscreen devices without exposing fingers to blistering cold. If you need gloves when you run, you’ll like these gloves. If you use a phone or other touchscreen device when you run, you’ll like these gloves. If you listen to music, and want to be able to change the song or adjust the volume, you’ll like these gloves. 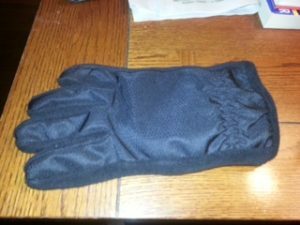 Point is, these gloves are versatile and solve a lot of winter-related running issues. Like most winter wear, these gloves are worn primarily in places where winter means lower, colder temperatures: the Northeast, Midwest, and Great Plains primarily, but anywhere that it gets cold enough for gloves. I suppose somebody with particularly bad circulation could find use for these gloves in warmer climates, but really, this is for subzero running. “Installation” is a two-step process: place the left glove on the left hand, and the right glove on the right hand (though, I believe this can also work in reverse!). They’re gloves, you’ll figure out how to use them. Oh, I suppose that I should describe the SmarTouch aspect of the gloves? Fair enough. The strip that is designed to be used on the touchscreens of your devices runs through the middle of the pointer and middle fingers on each glove, so those will be the fingers that you use. The touch strip runs the full length of the fingers on both the top and bottom of the finger, so you don’t have to be super precise in that regard: you could scroll with your “fingernail” or your “fingerprint,” so to speak. To test this product, I compared performance on multiple touchscreen devices to regular, non-athletic gloves at various states of activity (sitting, walking, running). The best thing about these gloves is that they are universally usable regardless of what device you are using. 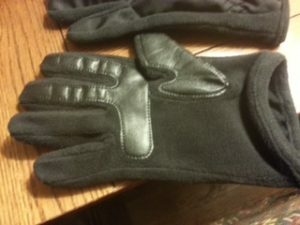 I tested this product with both Android and Apple devices, and the gloves worked just as well on both. So good news: there’s no need to run out and buy an expensive phone to work with your brand new gloves! The way I look at it, these gloves are striving to be a “Goldilocks” product in the two features that it has been designed to do. The Isotoner SmarTouch’s touch strips definitely improve the ability to use touchscreens effectively. While running with gloves on, these gloves are a noted step up from trying to swipe on a touchscreen with, for example, bulkier gloves that you would use if you were bundling up to go sledding. Moreover, I compared the touch strip against the non touch strip parts of the glove, and the former does indeed work better. We couldn’t discuss Isotoner Gloves without mentioning Dan Marino! At the same time, the SmarTouches—while a marked improvement over gloves—are no substitute for using your own skin. I did notice that I was less precise with my fingers when the gloves were on, and touchscreens were less responsive as well. Put another way, I do not think that a runner would use these gloves unless they were needed due to the weather. The Isotoner SmarTouch gloves score similarly in keeping hands warm, too. Obviously, gloves are warmer than no gloves. 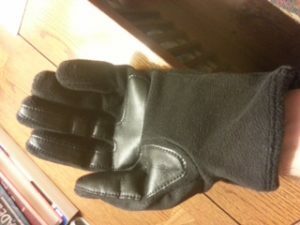 But, as is typical of athletic gloves, they are thinner and have less fabric than non-athletic wear gloves and, correspondingly, are less warm. In sum, I think these gloves are good in a pinch. I personally prefer running when I do not need to wear gloves, because then I neither need to worry about messing around with my phone to adjust music/set my run apps, and I am not worried about my hands freezing. When needed, however, it is nice not having to choose between warm hands and bringing your phone with you on a run. In that regard, Isotoner SmarTouch gloves will take care of you. Check out our top tips for running in cold weather. Neither Stephen nor Casual Runner received any consideration or compensation for this review, and the opinions are solely those of the author.